As explained in our medieval games and gambling page, hiring entertainers to come and perform was very popular amongst royalty and noble families in medieval times. They would regularly have plays and puppet shows performed and welcome travelling minstrels to entertain their friends and family. 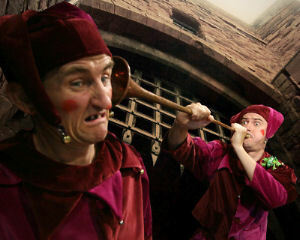 Ask anyone today what kind of entertainer existed in medieval times and the likely answer will be ... jester or juggler. The Medieval Jester - a medieval jester was usually in the employ of or hired for a special occasion by royalty and noblemen. Performances took place in the castles and noblemen's homes. The jester's repertoire comprised of storytelling, reading poetry, often some acrobatics and juggling skills. The equivalent today is what people refer to as a 'speciality act' - a professional entertainer who uses comedy and a particular skill such as juggling or card magic and who is paid to perform on stage or at private functions. The Medieval Juggler - a medieval juggler was a comic performer who used humour (often bawdy) alongside his juggling skills. A juggler generally only performed in public places such as in market places, in the street and at medieval fairs. To make a living of any kind, a juggler therefore had to rely upon his audience for tips. The equivalent today is what people refer to as a 'street entertainer' - a highly skilled juggler who can perform serious juggling feats as well as comic ones and who performs in public places such as market places in tourist resorts and cities or in special fairs and town/city celebrations. Sometimes they will be relying on tips from the public but, unlike in medieval times, they will often be professionally engaged for both public and private function performances. We came across a modern day 'medieval' style juggler called David Ford aka 'The Fire Man Dave'. A highly skilled, professional juggler, David recently granted us an interview just for medieval-castle.com. He answered LOTS of questions - such is our curiosity - and we are grateful to him for his in depth and honest answers. If you would like to share an insight into the world of the 21st century medieval style juggler read our Modern Medieval Juggler page.